Looking for a quick one-pot pressure cooker meal? 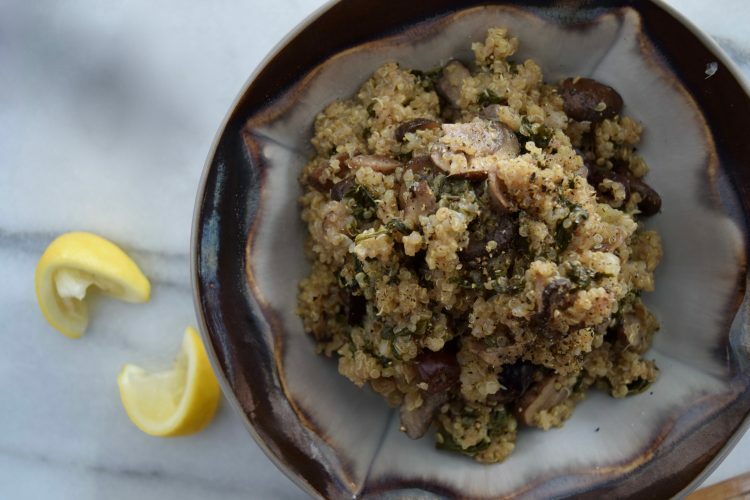 Try this Mediterranean Mushroom Quinoa. A pressure cooker is your weeknight BFF. Pressure cookers intensify the flavor and cook things upwards of 50% faster than conventional methods. Which means, you can whip up a fast meal that only tastes like you spent hours cooking it. This Mediterranean Mushroom Quinoa, with spinach, lemon, and Kalmata olives is an easy, flavorful weeknight meal. Heat the pressure cooker pan to medium heat, add oil, onion, and mushrooms. Cook for 7 minutes, stirring occasionally. Add quinoa, water, olives, and spinach. Secure the lid, set to high pressure, and put the heat up to high. Once the pressure cooker has reached high pressure (a knob will pop up), reduce heat to medium/low and cook for 5 minutes. Remove the pot from the heat, and let the pressure release naturally, about 10 minutes. Season with salt, pepper, and lemon juice to taste, and serve.